One of the many memorable vehicles produced at Buick City. (Photo courtesy of papajim). Last month, readers reviewed what's left of Flint's auto factories. Today's New York Times has a portrait of the "Last Holdouts" at Buick North. All that is left is Flint North, which built more than 20 million of G.M.’s 3800-model V-6 engines until production ceased last August. Some workers are removing equipment and preparing to start building four-cylinder engines for the Chevrolet Volt and Cruze at a newer plant across town next year, while others still build torque converters, gears, pistons, shafts and other powertrain components. The plant is surrounded by crumbling and empty buildings, and dead-end streets that once led into Buick City. It is a neighborhood of boarded-up stores and near-desolate streets, with the exception of the overflowing parking lots on Sundays at the Baptist churches along Industrial Avenue across from the plant. The last 450 workers feel fortunate to have another factory to go to, having seen too many friends and relatives laid off over the years. That way of life is vanishing at G.M. plants across the United States, but no city has been affected like Flint. When Buick City was at its peak production in the mid-1980s, G.M. had 80,000 workers spread across the city. Now it is down to about 5,000, a number that could fall more in a bankruptcy. 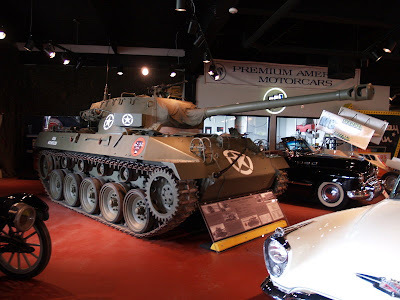 The "tank" is an M18 tank destroyer from near the end of WWII. M18s were light and thinly armored, designed to be the fastest tank destroyers of WWII. They weren't intended to "duke it out" with enemy tanks; instead they fired from ambush, at the thinner side armor of enemy tanks whenever possible, then used their speed and agility to get away before other enemy units could return fire. They weren't a perfect design, but their crews liked them. I've been in El Salvador for a couple of months for work. The only news paper available (in paper form), is the N.Y. Times. You can still get teased for being from Flint in Central America!